Clean, spacious rooms. Very convenient location. Rooms are a bit dated. Would benefit from some renovations. When you need a holiday but don't have the time to plan a full-scale trip, a staycation is the perfect way to unwind. Minus the fuss of passports and travel time, go straight to checking in to your luxe Singapore hotel and start your vacation time right away. Get pampered in a luxury hotel, escape your HDB for a week in an affordable hotel, celebrate your birthday living it large beachside at Sentosa, have a party weekend with friends staying near nightlife hotspots. So many options! Singapore has transformed from fishing village to modern metropolis, with an impressive skyline in the CBD, an upscale shopping boulevard along Orchard Road, blossoming neighbourhoods, and lots of makan spots to be uncovered. Match interesting things to do with your choice of Singapore hotels. 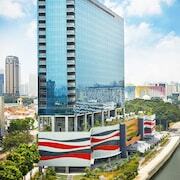 A staycation is a good way to experience different neighbourhoods in Singapore. You might be surprised to find that life feels a little different for fellow Singaporeans who live on the other side of the island. Drop your bag off at a hotel in Balestier and go on the Balestier food trail, checking out shop houses and heritage buildings in that area. Stay in Little India and take in the sights and sounds of life there. Find a Changi villa for a retreat closer to nature. Make a list of things to see and do -- historical tours, famous temples, iconic buildings, award-winning restaurants, art jams. 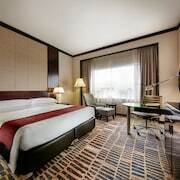 Then go about your staycation with part of the day exploring the parts of Singapore you don't know enough about, and the rest of it relaxing like royalty in a comfortable bed, swimming in your hotel pool, enjoying delicious buffets. 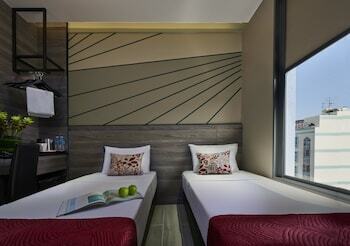 Of course, a romantic staycation makes lots of sense for Singaporeans. Spend a couples weekend in a romantic hotel splashing about in the pool, in beds that feel like sleeping in clouds, lounging on your private balcony and doing whatever you want. Makan, Makan, Makan! Eating is at the top of the list of things to do in Singapore. A foodie staycation is as good an excuse as any. Find a hotel in your favourite makan spots like Newton, Balestier or in the city centre where you're well connected to an endless array of Hainanese chicken rice, satay, laksa, roti prata all the way to foreign flavours like tacos, steaks, Brazilian churrasco. The Singapore Zoo is a timeless classic. Especially if you have kids. It is, after all, one of the best zoos in the world. By public transport, its a little bit of an effort to get to. Many hotels in SIngapore's city centre offer a shuttle service to Mandai Zoo, making this a top choice for a family staycation. In the market for a lot more pampering and lounging about? 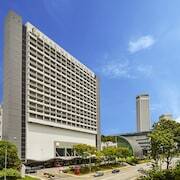 There are lots of popular Singapore hotels that have become tourist favourites. Go see for yourselves what the fuss is about! Good things to lookout for: Singapore hotels with pools, hotels with award-winning facilities like restaurants or spas, hotels with rooftop pools or bars, and rooms with bathtubs. All good recipes for a pampering staycay. 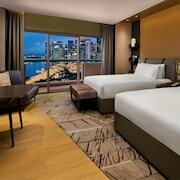 Book a Singapore beach resort in Sentosa to experience more of an island feel. The luxury resorts in Sentosa are great for a romantic escape that makes you feel you're on a holiday. 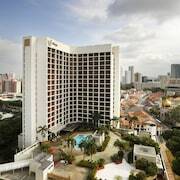 It's also a top choice for a family staycation due to the proximity to Universal Studios Singapore and the SEA Aquarium. The Marina Bay and Esplanade area have overtaken Orchard among top spots for visitors to get a Singapore hotel. But hotels in Orchard are still a good option, for convenience in getting around, for shopping and eating in good restaurants all on your doorstep. Around Beach Road, Bugis, Arab Street and the Padang, there are a few more options that place you in a good location. Visit museums, bars with a view, join in events and festivals. Lots of interesting things to do around here, and good chance for cheaper hotels as these aren't the tourist headliners but you're just on the city fringes so its still really convenient. Where you choose to stay can be just as enjoyable as the holiday itself. If you're going to treat yourself to a fuss-free staycation, why not go all the way? 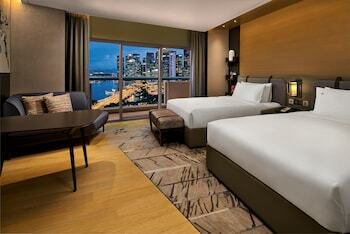 There is no shortage of luxury hotels in Singapore. The Shangri-La Hotel is set in a tropical paradise which has a large luxurious pool surrounded by palm trees. For other fantastic luxury hotels, you could also try the Pan Pacific Singapore, Capella Singapore or The Fullerton Bay Hotel. All of these hotels have received above 4.5 out of 5 stars in customer reviews. Prices vary dependant on the time of year and also what types of extras you’d like in your room. 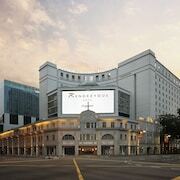 For something a little more affordable, the mid-range hotels in Singapore can feel just as luxurious as those in the city without the weighty price tag. One of our favourite mid-price hotels is the AMOY which includes breakfast in your stay. For a hotel that offers luxury at a lower price, try the Naumi Hotel which includes a buffet breakfast, Apple TV and Nespresso machine in your room. Plus a little rooftop pool and bar that's very chilled out. Other highly recommended hotels include Goodwood Park, the Park Avenue Rochester and the Royal Plaza on Scotts. Cheap hotels may be a little harder to come by in Singapore, but you certainly can find places to stay that offers excellent value. The following hotels still provide a great location and come with amenities such as free Wi-Fi and parking. 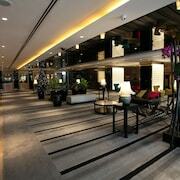 The Noble Hotel is located in Little India and has received 5 stars in customer reviews. The hotel has its own restaurant and café along with a dry cleaning service. You may also want to check out the Hotel YAN, The Haven by Jetquay or the Orchid Hotel, who all offer lower end prices and have received great customer reviews.